At the beginning of this month I've spent a few great days in Goteborg, at GUADEC conference. That was my second GUADEC (first time I've participated last year, in Strasbourg). There were a lot of interesting presentations, but the most I enjoyed all of the keynotes. As a Google Summer of Code student (I've worked for GStreamer project ), I was able to give a lightning talk about my project. It seemed to be interested to some people, so after that someone asked me to show him my project "in action". We were talking about possible improvements and new features. In the evenings organizers prepared for attendees some event, so I could integrate with other GNOME people. Moreover, they organized for us (GSOC students and mentors) a dinner, so I could meet other students a little bit better, talk mostly about our summer projects, but also about differences in education at their universities (people came from different part of world). In conclusion, I enjoyed GUADEC, all presentations and evening events. 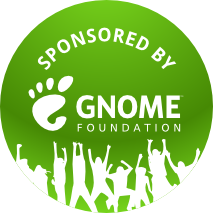 I'd like to thank the GNOME Foundation for sponsoring my travel and my hostel. My participation probably wasn't be able without Foundation's help. Thanks a lot!